Sevilla is, without any doubt, the best city to visit in April. 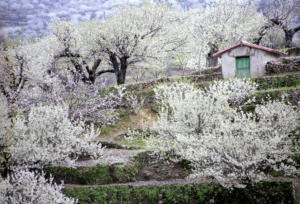 You could experience all that this quintessential city has to offer: orange blossoms, the most passionate Holy week, the popular fair and some other spring festivities. 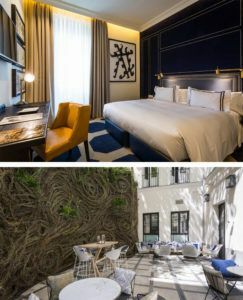 We would like to share with you our favourite hotels in Sevilla. Some of them are new to the city and we feel they will do great! This is THE Hotel in Seville. 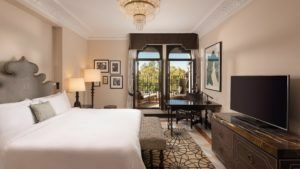 Commissioned by the king Alfonso XIII to play host to international dignitaries during the 1929 Exhibition, this luxury hotel remains an iconic cultural landmark, centrally located in the historic center, next to Reales Alcázares and Seville Cathedral. Following a significant renovation, completed in 2012, the hotel’s distinguished architecture and Moorish detailing have been enriched, showcasing native Andalusian design and heritage to a new generation of travelers. The hotel’s innovative décor, from the lobby to the inner courtyard, continues to reflect Sevillian style. 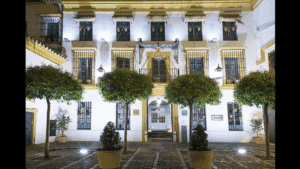 Hotel Casa 1800 Sevilla is a mansion-palace from the 19th century, located in the historic center of Seville, only few meters away from the Giralda tower. This house was built in 1864 following a traditional layout. Its studded solid wood doors allow entry to the palace with a horse-drawn carriage, from which when on-foot could then accesses a central courtyard from all rooms were distributed. A hotel with soul. 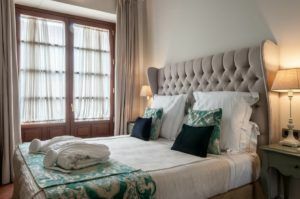 This property is one of our new discoveries in 2019, an early twentieth-century Sevillian palace, recently refurbished and providing all the home comforts to make your stay in Seville truly memorable. It is located in the heart of the old town and a stone’s throw from all the major sights. The hotel has spacious rooms with a unique décor that fuses Andalusian tradition with modern-day minimalist styles. Another new discovery for Just Explore on our recent hotels inspection in the city oly two weeks ago. 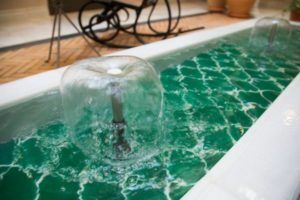 Despite its great location at only few meters from the Royal Alcazar, this small boutique hotel (only 18 rooms) is just off the beaten path from the tourists crowds, in a very quiet and peaceful corner. Built upon important Moorish, late medieval and contemporary archeological remains, visitors will be taken aback by the beauty of the rehabilitated elements such as the wall that borders with the Alcázar, fountains, canalizations, pottery and floors from past centuries. 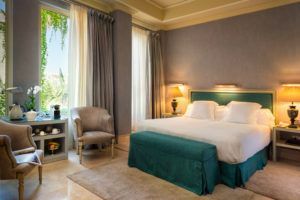 Discover the delights of staying at luxury accommodation whilst reliving centuries of history in the heart of Seville. 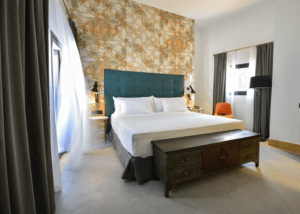 Sevilla has a great offer of small boutique properties and Casa del Poeta has always been one of our favourite since their opening. 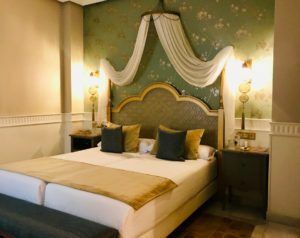 This luxurious boutique hotel (only 18 rooms) is a large 17th century house beautifully restored and carefully maintaining its original architecture and fine decorative features. A testament to former glories, it retains the traditional style of an authentic Sevillian mansion. This lodging is ideal for visitors seeking a peaceful stay with personalized attention, in a luxurious and unique environment. 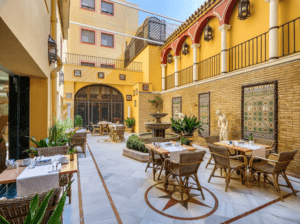 Luxury and style in the heart of Seville’s old town, this traditional Sevillian-architecture building used to be a local neighbours’ courtyard in the 18th century. Today, it is an ideal setting for guests to relax and dream. Inside, the contrasts are everywhere and emotions run wild. The colours and the aromas of the central courtyard evoke activity and energy. The stone, clay and chalk used in the building’s construction give it a touch of authenticity and a high architectural and historical value. This is a great choice for a good location, comfort and luxury. 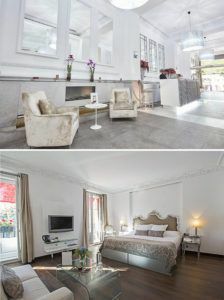 This boutique hotel of 24 rooms is located right in central Seville’s Old town, just 200 m from the impressive Gothic Cathedral. Set in a 16th-century palace, Palacio Pinello’s rooms have terra cotta floors and high ceilings, some of which feature ornate woodwork. You will also find some interesting, centuries-old ruins in the building. 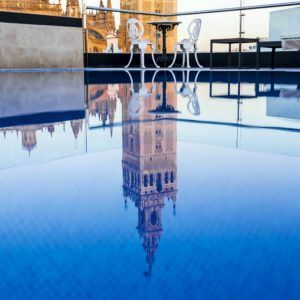 There is a charming turret and a roof-top terrace where you can enjoy a drink and views of the Giralda. 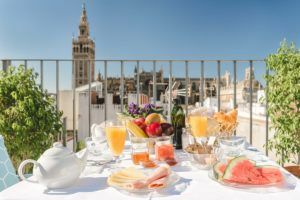 If you are searching for a more traditional look to experience the essence and the flavour of a typical Sevilla house, this is your hotel in Sevilla. Casas del Arenal is the fusion of two traditional 18th century homes linked through beautiful courtyards and galleries, creating a unique space of 27 rooms, where refurbishment works have resulted in the splendor of this Andalusian architecture. 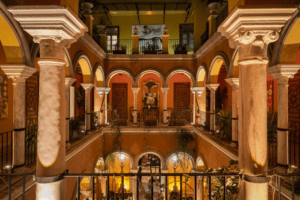 It is hard to describe as this hotel is not just a place to sleep or to rest while you are exploring the city, it is an experience itself in the heart of the Santa Cruz neighborhood (the old Jewish quarter). Another traditional option if you are searching for authentic and quaint accommodations at a good quality/price range. 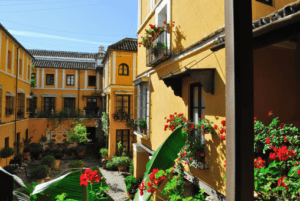 This hotel is set within 27 traditional Sevillan houses, connected by passages and courtyards. 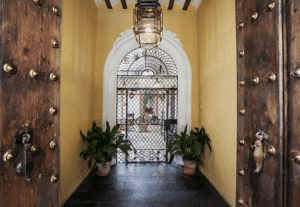 All rooms at Las Casas de la Judería offer traditional décor and maintain the building’s original features. They have antique furniture, wooden floors and French windows. It offers a rooftop swimming pool, spa, traditional Andalusian patios and classic décor. 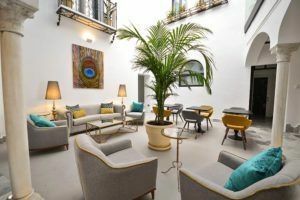 For those travelers with a more limited budget and wanting to stay off the beaten path, the H10 Corregidor is a charming Boutique Hotel located in Seville’s historic centre (between the Cathedral and the Alameda de Hércules). 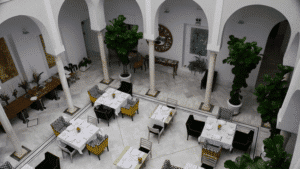 The hotel keeps the essence of Seville alive through its arabesque and Andalusian architecture. 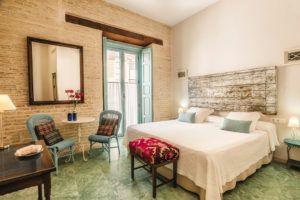 It offers very comfortable rooms, an Andalusian courtyard featuring a late 19th-century wrought-iron gate and original ceramic tiles from the 1929 Seville World’s Fair. This is one of our favourite B&B accommodation in Sevilla, at only 2 min walk from the Cathedral main entrance door. 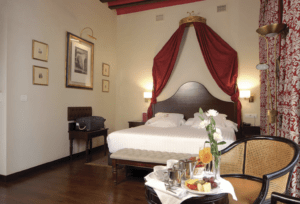 The hotel Casa de Colón is located in a historic manor house dating back to the 18th century. It is not a luxurious property but it keeps all the essence and soul of a traditional Sevilla house, beautifully restored and offering comfort and relax. Holy Week (locally known as Semana Santa), Easter is probably the most important celebration in Spain and stands out for its epic brotherhoods’ processions and an ancient traditions specific to each region. There are many different ways to experience Eater in Spain. We are sharing some traditions and customs with you so you know what to expect and attend if you ever take a trip to Spain this time of year. The atmosphere that characterizes the festivities is usually solemn and quite spectacular. Everything seems fully immersed in passion and emotion. 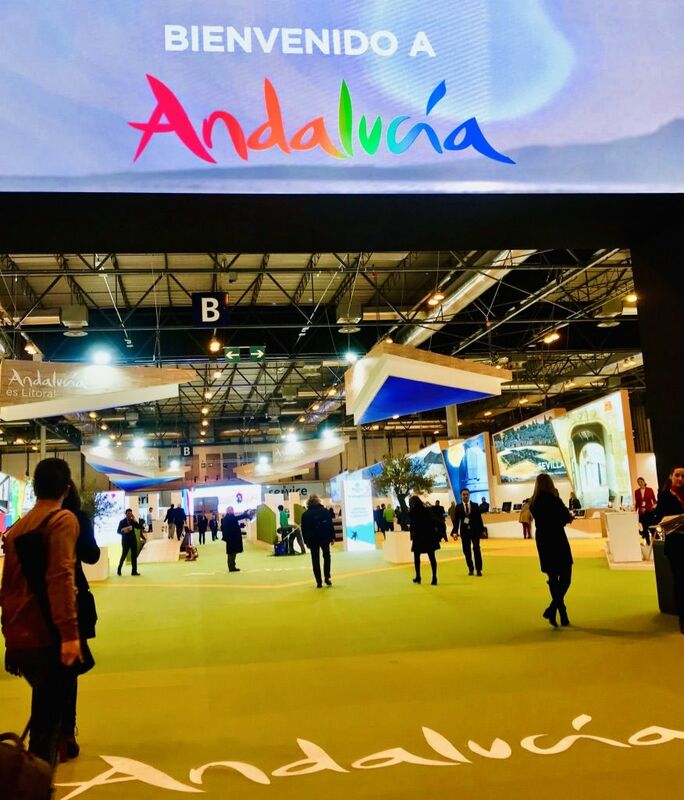 Although each Spanish region has its own customs and practices, Semana Santa celebrations are nowhere else as elaborate and spectacular as they are in Andalusia. Here, this important Catholic holiday is commemorated with a week full of color, art, religious fervor, and extraordinary processions. The festivities start on Palm Sunday (Domingo de Ramos) and last until Easter Monday (Lunes de Pascua), with the most dramatic and passionate parades held on Maundy Thursday and Good Friday. The most spectacular events take place in Malaga and Seville, where the streets are taken over by flamboyant parades (or pasos as we call it in Spain) displaying biblical scenes. A paso is an enormous float adorned with life-size wooden statues of biblical characters. In Seville, they are considered genuine artistic masterpieces, some of them dating back as far as the 16th century. 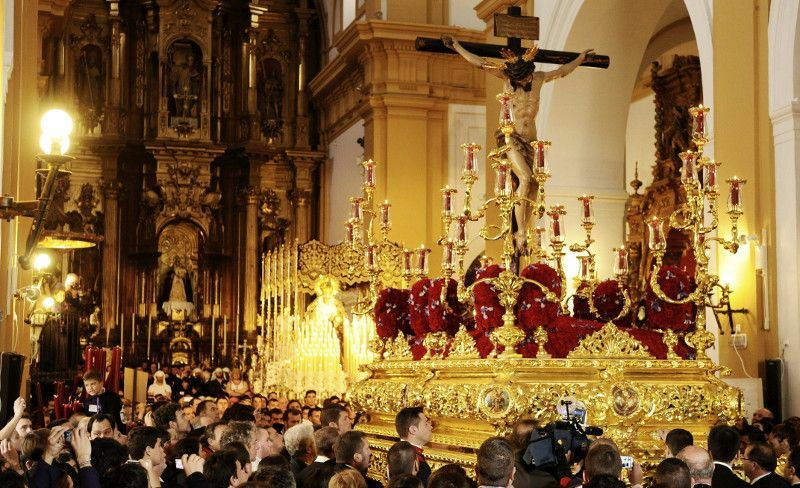 Each movable float belongs to a brotherhood, or cofradia (there are over 50 in Seville), and has its own distinctive decoration, colours and identity. A common feature, however, is the team of costaleros who convey the pasos on their necks or shoulders through the crowded streets. 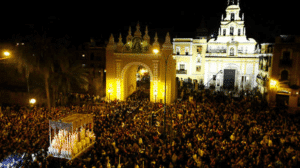 One of the highlights of the Holy Week in Seville is the night of Maundy Thursday, known as La Madrugá, commemorating the trial, the crucifixion and death of Jesus Christ. Buñuelos: Basically a fried doughnut or sweet fritters, made with simple ingredients such as water, milk, egg or yeast. 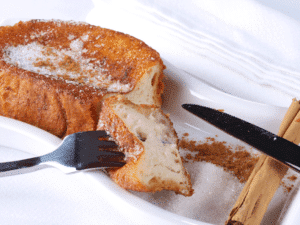 Torrijas: Thick pieces of bread soaked in a mixture of milk and egg, then fried with olive oil and served with honey and sugar. Hornazo (the sweet version): typical from Salamanca and Ávila in Northern Spain. A round bread filled with with almonds, sugar and eggs. Pestiños : commonly made in Southern Spain by deep-frying a piece of dough – often flavoured with sesame – in olive oil and then glazing it with honey or sugar. Mona de Pascua: Especially popular in Catalonia and Valencia, this cake is topped with either boiled eggs, or chocolate ones, as well as colourful decorations. Ronda is one of our favorite destinations due to its versatile landscape which allows every kind of outdoor activities. Also, the town itself is a picturesque gem offering the visitors the most breath-taking views, amazing sunsets and incredible places to see. In Ronda you will be able to create unforgettable memories. As you know, before offering new experiences to our clients, we first try them all to make sure that they are reliable and fulfil the level of quality that we always require. 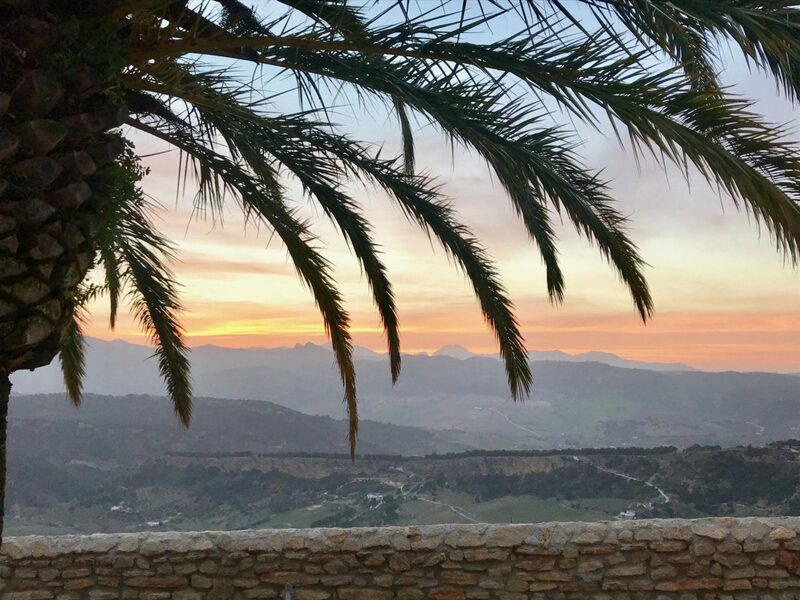 So, here is the exciting news we have been announcing in our social networks: new activities in Ronda for all type of clientele: families with kids and/or teenagers, couples, solo travellers and seniors. 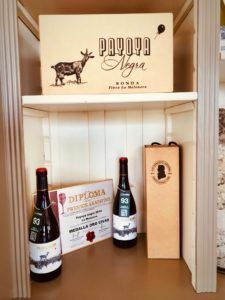 We are big fans of Ronda wines and we have been dealing with some local producers and boutique wineries in the area but we are now adding some new ones to our portfolio. One of these new discoveries is a modern and quite avant-garde winery with investors from the Priorat wine region in Catalonia. Its philosophy consists on two main pillars: the cultivation of indigenous grapevines and a meticulous winemaking process that respects the soil where the grape grows. The other winery we visited is a family owned business producing a very unique author wine. They specialise in the organic and biodynamic viticulture since 1982. Some of their bottles have a limited edition and you can only find them in very specific shops and local bars. We love them both and we will certainly manage to get our clients to try their wines. How about exploring the beautiful Mediterranean forest on a horseback? 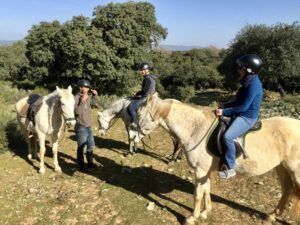 We were offering horseback riding tours in other areas in Andalucia but not in Ronda yet. We love this new company philosophy and their behaviour with the horses they breed. You learn about the animals and their environment before ride them and that’s is crucial enjoy a safe and pleasant experience. These happy horses will create the happiest moments of your vacation. This is a very exciting and fun experience: you follow the instructions of an expert monitor but you get to drive your own buggy! 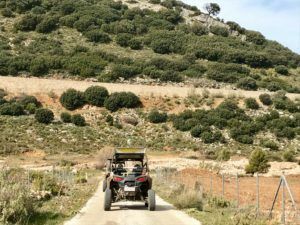 There are several trails options but we picked the most popular one of aprx 1.5hrs offering incredible views over Ronda and the impressive new bridge , the Tajo gorge, cliffs and the Guadalevin river. 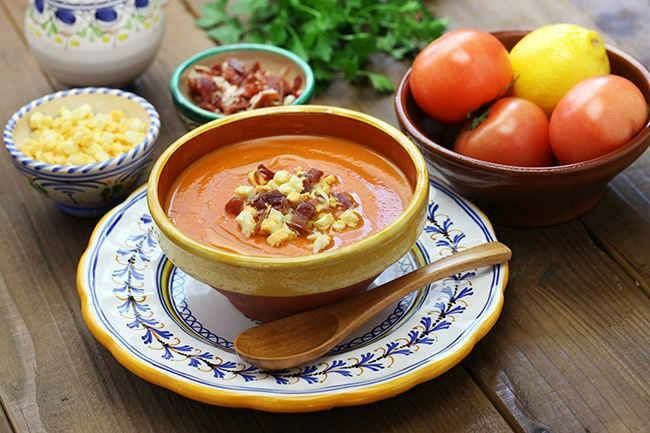 Gastronomy lovers or just fancy an immersion activity into the Andalusian culture? 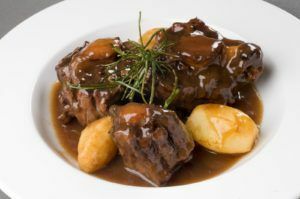 Ronda offers a great variety of cooking experiences. 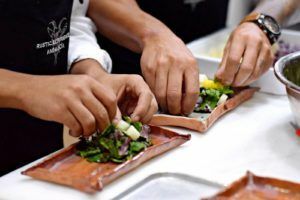 Our favourite is a hands-on cooking class with an incredible setting in the middle of a vineyard offering the most spectacular views over the Puente Nuevo (the new bridge). 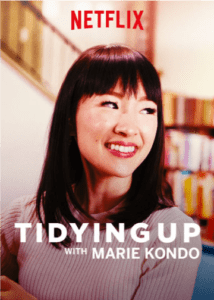 Best time to do it? Sunset time in Spring or summer. Can’t miss this magic setting…. Madrid is the capital of Spain, a city with hidden magical corners and full of historical monuments, buildings and museums. 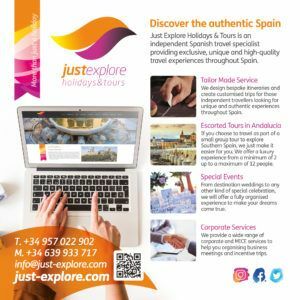 It is a must visit to understand Spain, its culture and its lifestyle. 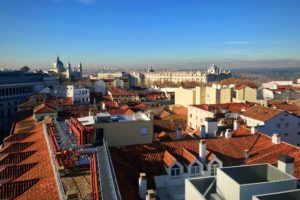 Madrid´s famed neighborhoods such as Las Letras, Salamanca, Malasaña or Chamberí are the perfect places to stay and enjoy the multiple options that this multicultural city has to offer. Often, one of the most daunting tasks when traveling is choosing where you are going to stay at. 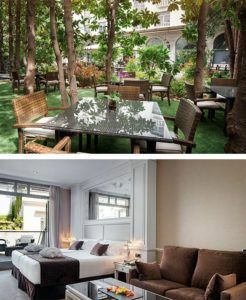 Lucky for you, we have put together list of our 9 favorite hotels in Madrid, to cater to every taste! This hotel opened about a year ago. The location is unbeatable and the views from its terrace are the best in the city. We particularly like the sophisticated decoration and the stylish common areas. The original Gran Hotel Inglés was built in 1886 and after many decades of multiple uses. 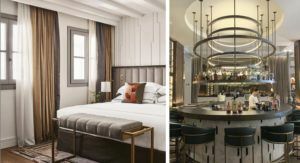 The incredible building has totally been refurbished only twelve months ago to reopen with a new look but with the same halo and sophistication that was back in the golden XIX century. You will find it right in the heart of the Barrio de las Letras. This is without any doubt the most authentic neighborhood of Madrid for being the meeting point of “la crème de la crème” on the literary and artistic scene of Madrid. 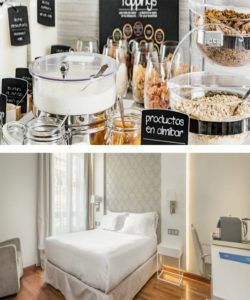 This hotel can be found on Barquillo Street, another key street to explore Madrid. 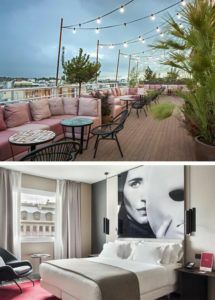 Its smart, cool and chic design makes of this building the perfect boutique hotel for a honeymoon or a city break. You can have breakfast at any time of the day and the same applies to the check-in terms: whatever time you arrive, you can be sure that your room will be available! Is it not handy for those early arrivals flights? Just in front of the Retiro park and in the heart of the stylish Salamanca neighbourhood you´ll find the Puerta de Alcalá. Its decoration is the perfect balance between contemporary and classic style. It offers stunning views over the Retiro Park and the Puerta de Alcala gate, one of the icons of the city. 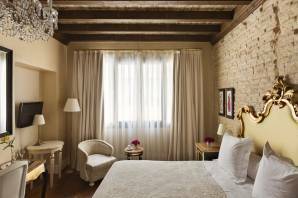 This hotel is probably one of our favourite of the Spanish Hospes boutique hotels. It’s difficult for us to choose as we love them all. If you travel with pets, they´ll be welcomed! This hotel is a very good option if you are searching for the right balance quality-price. It is located in the Salamanca neighborhood. We particularly like its courtyard, offering a beautiful garden which creates the feeling of being in an oasis in the middle of the city. The rooms are large and luminous featuring a small kitchenette which might be very practical for those travelers choosing to stay in rather than having dinner out every night. 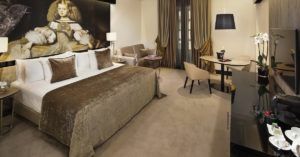 Even though we try to avoid big chains, we love this Radisson hotel in Madrid. It has a boutique feel with only 60 bedrooms. It’s located in a protected building just in front of the Prado Museum. For those art lovers travelers, this spot is definitely the best option! Despite its 3 star category, Alonso Martinez Hotel surpasses our expectations. It is located in a very stylish building of the residential area of Chamberí, a very quiet but full of life district. 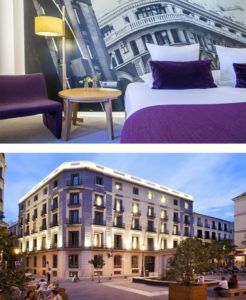 The hotel is only at a 15 minutes´ walk from Paseo del Prado and Gran Vía. The rooms are bright, decorated with neutral colors and spacious. Their breakfasts are one of the best in town! And for those who like sleeping in, on Sundays, you can check out until 15:00 pm! We will be attending the WTM fair in London between the 5 and the 7 of Nov 2018. 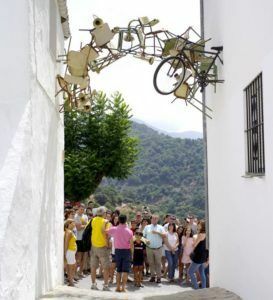 What if we imagined a classic Andalusian white town where tradition and avant-garde art coexisted? What if we added to the Arabic layout of its cobblestone streets, to its secluded squares and its colorful balconies adorned with flowers, dozens of works by contemporary artists from all corners of the planet? 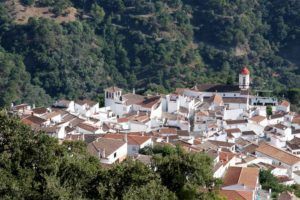 It turns out that this place exists, it is in the province of Malaga and has its own name: Genalguacil, known as “Pueblo museo”, which during the first half of August will host a new edition of its famous Art Encounters. These meetings have managed to attract the attention of artists from all five continents, attracted by their exoticness, and even the New York Times saw fit to dedicate an extensive report in 2014. 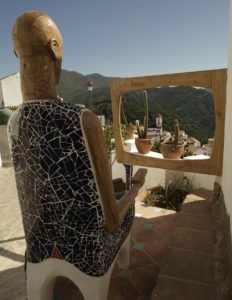 The dynamics are simple: the municipality of the locality provides maintenance and accommodation to the selected artists and in return, the creators leave their works as a legacy in the territory where they were made. However, it is an event that has acquired a certain prestige, so it is not easy to opt for one of the places that are awarded in each call, which are carefully selected by different personalities from the art world. In fact, for this 2018 call, only ten of the 137 projects submitted from 12 different countries have been selected.